This is a recreation of a collector's dream. 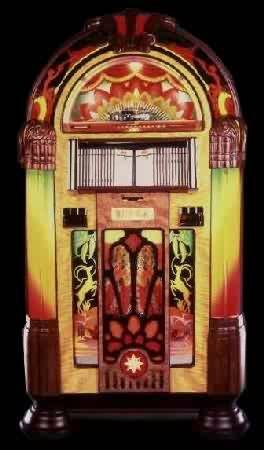 The rarest of jukebox wonders was the elegant wartime machine, of which only a few hundred were made. The Gazelle features art deco fawns playing the Pipes of Pan above and two leaping gazelles etched in mirrored glass panels below. The Gazelles are brilliantly illuminated with ever changing colors. With all the craftsmanship of a classic, the front door is finished in satinwood and burled elm. The top crown, shoulders, pilaster supports and even the base are carved out of hardwoods, walnut and alder.